Bryan and I left for our epic two and a half week honeymoon the day after our wedding. OH MY GOD it was amazing so I really wanted to share some highlights and funny stories with you all! We went on a nine day Celebrity cruise through Italy and the South of France (post coming soon) and ended the trip with 4 days in Amsterdam (post also coming soon). 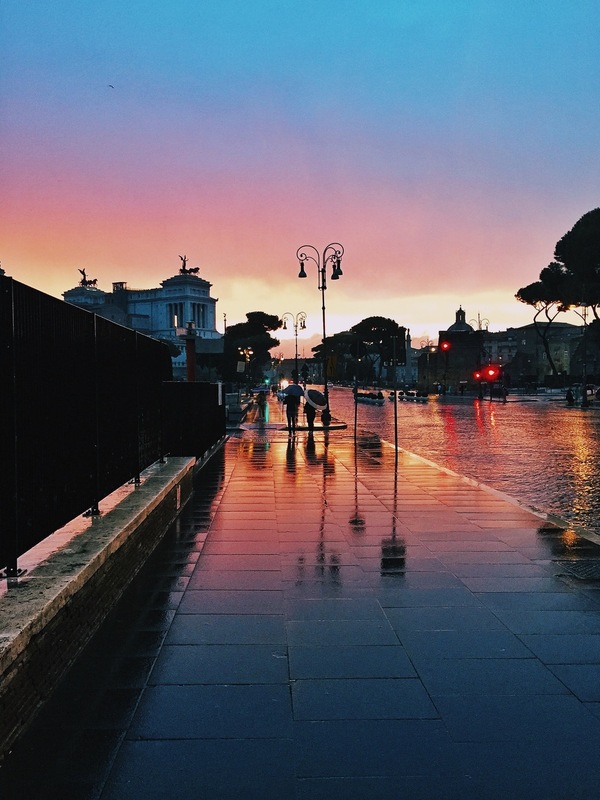 The cruise left out of Civitavecchia (Rome), Italy so we decided to spend a few days in Rome beforehand! Our flight connected in Moscow, Russia (we found an Aeroflot flight for a crazy good price). Not going to lie, the flight was rough. It was 9.5 hours of SCREAMING toddlers and infants (that were all in the same row, weirdly) so that was fun. I was proud of Bryan for keeping it together, ha! God bless sound canceling headphones and endless movies, I watched 4. Once we arrived in Rome we waited forever for our bags, to then find out one was left in Russia. Great. After taking several forms of public transportation, we finally arrived at our cute little Airbnb apartment. It was only 2 blocks from the Colosseum, all the ruins and tons of cute restaurants and markets. Such a great spot! We explored the area a bit then found this awesome restaurant where we ate incredible pasta and drank our body weight in red wine. The Colosseum was so close to our place! We spent most of our time exploring the streets and alleyways that surrounded us. So many cool little shops and restaurants to check out. We went to Vatican City the day the Pope was in DC (hometown swap!). We didn't get tickets to go inside because we had to make our way back to the airport to pick up our bag that was left in Russia. Plus my outfit wasn't appropriate. About 6 different guys told me that while we were walking there. I KNOW SIR AND I'M NOT GOING INSIDE. That got really annoying really fast. Ladies, make sure you're wearing pants and a sweater if you don't want people bothering you about your outfit if you are anywhere near the Vatican. Other than that, the place was incredible. Can't wait to go back to see the inside. Beer and/or wine all day everyday. Chugged a couple before taking a taxi back to the airport. If you follow me on Instagram then you probably have noticed that I love making Bryan jump for a photo (#bryanups) because the man has got serious ups. As I was taking this I heard a weird noise but didn't think that much of it because it was raining hard and lots of stuff was going on around us. I look up to see Bryan running towards me laughing really hard when I realize that noise was his pants ripping. He blew out the entire crotch of his pants, and it was hilarious. R.I.P. sweet red pants. Rome was wonderful and I can't wait to go back! Honeymoon Part II (Celebrity Cruise) coming soon!